SYRACUSE, N.Y. (CNS) — Linda LeMura, newly named president of Le Moyne College in Syracuse, is the first laywoman to be appointed president of a Jesuit college or university. The college, founded in 1946, is used to some firsts. It also was the first Jesuit school of higher education to open as a coeducational institution. LeMura, who served as provost and vice president for academic affairs at Le Moyne since 2007, was unanimously elected by the school’s board of trustees April 3 to succeed Fred Pestello, who announced in March that he would be leaving Le Moyne at the end of June to become president of St. Louis University, which is also Jesuit. Pestello was Le Moyne’s first lay leader. LeMura said in a statement that “it is truly humbling” to be selected as the school’s president. Prior to her work at Le Moyne, LeMura had several titles in her 11 years at Bloomsburg University of Pennsylvania, including professor, graduate program director, chairperson and assistant chairperson in the departments of exercise science and biology and allied health sciences. A native of Syracuse, LeMura received her bachelor’s degree in biology and education from Niagara University and her master’s and doctorate degrees, both in applied physiology, from Syracuse University. LeMura has taught applied physiology, anatomy and physiology, bioethics and the biology of aging. Her research and expertise is in pediatric obesity, pediatric applied physiology, lipid metabolism, and energy metabolism. 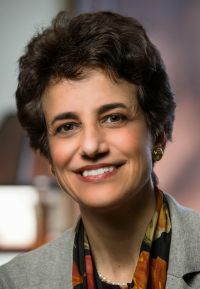 At Le Moyne, she played a pivotal role in the revision of the school’s core curriculum, the establishment of the Madden School of Business and the renovation and expansion of the college’s science facilities. He noted that LeMura was part of a small group sent to Rome last year to brief Jesuit Father Adolfo Nicolas, superior general of the Society of Jesus, prior to his address to the board chairs and presidents of the U.S. Jesuit colleges and universities. “Based on her familiarity with the mission and identity of Jesuit institutions, she comes to the Le Moyne presidency very well prepared,” he said. LeMura is married to Lawrence Tanner, professor of natural systems science at Le Moyne. The couple’s daughter, Emily, is a sophomore at Jesuit-run Fordham University. The Post-Standard daily newspaper in Syracuse reported that LeMura does not plan to live in the home the college purchased for its president two years ago. She will continue to live at her family home when she takes the helm of the college, which is just four miles from where she was raised.